Over hundreds of millions of years of evolution, nature has produced a myriad of biological materials that serve either as skeletons or as defensive or offensive weapons. Although these natural structural materials are derived from relatively sterile natural components, such as fragile minerals and ductile biopolymers, they often exhibit extraordinary mechanical properties due to their highly ordered hierarchical structures and sophisticated interfacial design. Therefore, they are always a research subject for scientists aiming to create advanced artificial structural materials. 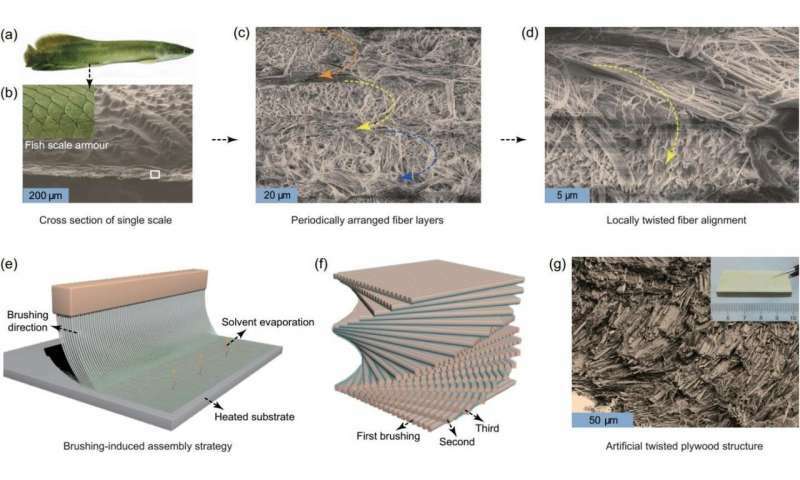 Through microstructural observation, researchers have determined that many biological materials, including fish scales, crab claws and bone, all have a characteristic "twisted plywood" structure that consists of a highly ordered arrangement of micro/nanoscale fiber lamellas. They are structurally sophisticated natural fiber-reinforced composites and often exhibit excellent damage tolerance that is desirable for engineering structural materials, but difficult to obtain. Therefore, researchers are seeking to mimic this kind of natural hierarchical structure and interfacial design by using artificial synthetic and abundant one-dimensional micro/nanoscale fibers as building blocks. In this way, they hope to produce high-performance artificial structural materials superior to existing materials. However, due to the lack of micro/nanoscale assembly technology, especially the lack of means to efficiently integrate one-dimensional micro/nanoscale structural units into macroscopic bulk form, mimicking natural fiber-reinforced composites has always been a major challenge. Recently, inspired by the micro/nanoscale twisted plywood structure of the natural Arapaima giga scale armour (a-d), the biomimetic research team led by Professor Shu-Hong Yu from the University of Science and Technology of China (USTC) proposed a high-efficiency, bottom-up 'brushing-and-laminating' assembly strategy (e-f) with the biocompatible micro/nanofibers as structural units, and successfully fabricated three-dimensional bulk biomimetic twisted plywood structural materials (g). Through hierarchically controlling the fiber alignment in the biopolymer matrix, the mechanical properties of resultant materials can be precisely modulated. They found that the obtained artificial materials closely replicate the multiscale structural and toughening mechanisms of their natural counterparts, realizing excellent mechanical properties far beyond fundamental structural components; they are comparable with those of natural bone and many other natural and artificial materials. More importantly, the proposed assembly strategy is eco-friendly, programmed and scalable, and can be easily extended to other materials systems. Therefore, it provides a new technological space for designing more advanced biomimetic fiber reinforced structural materials (especially armour protection materials).